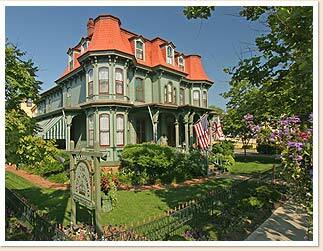 Cape May is a charming, Victorian seaside town located at the southern most tip of the state of New Jersey. We love Cape May for its Victorian architecture and the fact that you can walk to virtually everything (the beach, shops, great restaurants). Although we had been to Cape May several times, my husband and I decided to babymoon there before the arrival of our second daughter. For our babymoon, we stayed at the Queen Victoria Bed & Breakfast Inn. The Inn is centrally located in the heart of Cape May, only a 1.5 block walk to the beach and 1 block to the shops on the Washington Street pedestrian mall. The service and amenities at the Queen Victoria were outstanding. We stayed in the Regent's Park suite which is actually a little cottage set among the Queen Victoria Gardens. Our suite had a separate sitting room with a gas fireplace which was nice because it was very cool the weekend we visited. We enjoyed the Inn's generous breakfast buffet each morning and tea each afternoon. The Innkeepers, Doug and Anna Marie provided exceptional service and were always available to help with restaurant or activity suggestions and reservations. Our babymoon just happened to fall over our wedding anniversary and we were presented with a nice memento upon check-in - a print of the inn with our names and anniversary date included. Cape May really is a four season resort and there is plenty to do all year round. For our babymoon, we really just wanted a low-key, relaxing weekend getaway so we were content to just relax in our suite, stroll around town, shop and eat! On prior and subsequent trips to Cape May, we experienced a lot more of what the town has to offer. Here is our top ten list of things to do on your Cape May babymoon. 2. Take a romantic horse-drawn carriage ride through town at night. 4. Take a stroll down historic Jackson St (my favorite street in Cape May) and stop to admire the ornate Victorian architecture. 6. Catch a spectacular sunset at Sunset Beach. If you're visiting from May-September, be sure to stay for the flag ceremony, held every evening at sunset. 7. In warmer months, relax on the beach with a good book. In cooler months, stroll the beach in search of shells to take home as a babymoon souvenir. 9. Enjoy one of the many festivals, concerts and special events scheduled year-round in Cape May. Check out the calendar of events at Capemaymac.org. 10. Indulge in as many quiet, romantic dinners as you can, while you can! Cape May has a wonderful selection of fine dining restaurants. Thank you for the top ten! It will be my first time in Cape May.